Add a new custom tab. Add a new group to tab. Change the order of the tabs. Change the name of a tab. Add commands to a custom group. Remove commands from custom groups. Remove groups from a tab. Move a group to a different tab. Change the order of the groups within a tab. Change the name of a group. You cannot remove built-in tabs — but you can hide them. You cannot remove commands from built-in groups. You cannot change the order of commands in a built-in group. You make manual changes to the Ribbon in the Customize Ribbon panel of the Excel Options dialog box. The quickest way to display this dialog box is to right-click anywhere in the Ribbon and choose Customize the Ribbon from the shortcut menu. 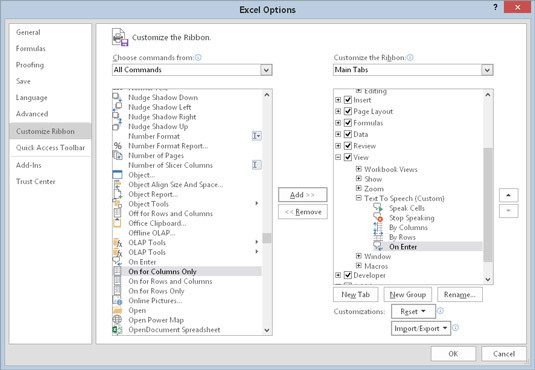 The Customize Ribbon tab of the Excel Options dialog box. Use the drop-down list on the left (labeled Choose Commands From) to display various groups of commands. Locate the command in the list box on the left and select it. Use the drop-down list on the right (labeled Customize the Ribbon) to choose a group of tabs. Main tabs refer to the tabs that are always visible; Tool tabs refer to the context tabs that appear when a particular object is selected. In the list box on the right, select the tab and the group where you would like to put the command. You need to click the plus-sign controls to expand the hierarchical lists. Click the Add button to add the selected command from the left to the group on the right. Keep in mind that you can use the New Tab button to create a new tab and the New Group button to create a new group within a tab. New tabs and groups are given generic names, so you probably want to give them more meaningful names. Use the Rename button to rename the selected tab or group. You can also rename built-in tabs and groups. Here, you see a custom group, named Text To Speech, that was added to the View tab (to the right of the Zoom group). This new group has five commands. The View tab with a new group named Text To Speech. Although you cannot remove a built-in tab, you can hide the tab by clearing the check box next to its name.